God told the Israelites not to speak or act against God’s temple in the Old Testament, upon penalty of death. In the New Testament, people are now the temple of God. Therefore, we must never speak or act against God’s temple-His people. 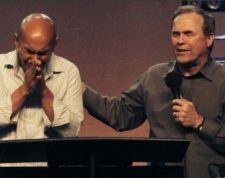 Rick Warren, Mike Bickle, and Mark Driscoll are men of God who should never be criticized, because Francis Chan knows them personally, and they have good hearts. If you speak out against these “people of God,” Chan wouldn’t be surprised if God took your life, because that’s what He promised in the Old Testament.